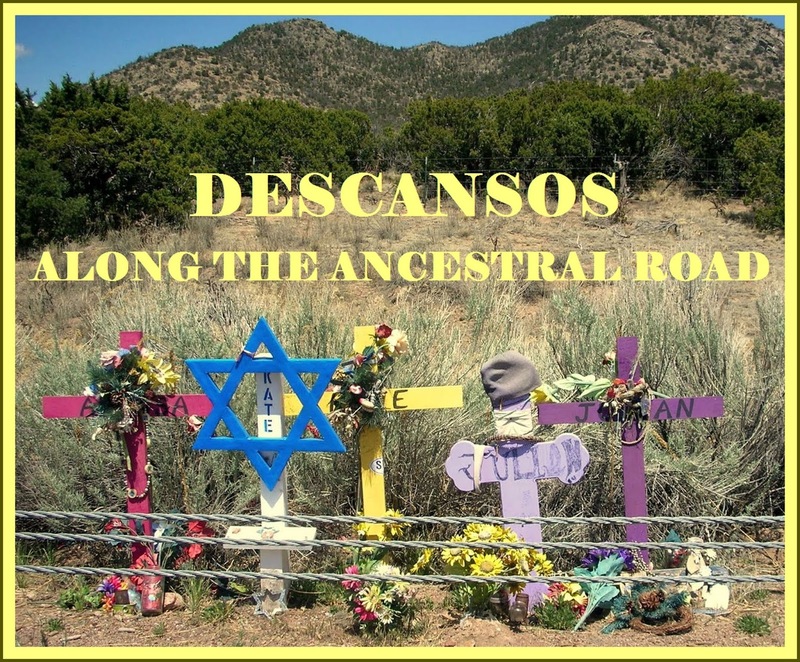 On November 4th, 2016, Descansos Along the Ancestral Road opened at FreeStyle Gallery in Albuquerque. 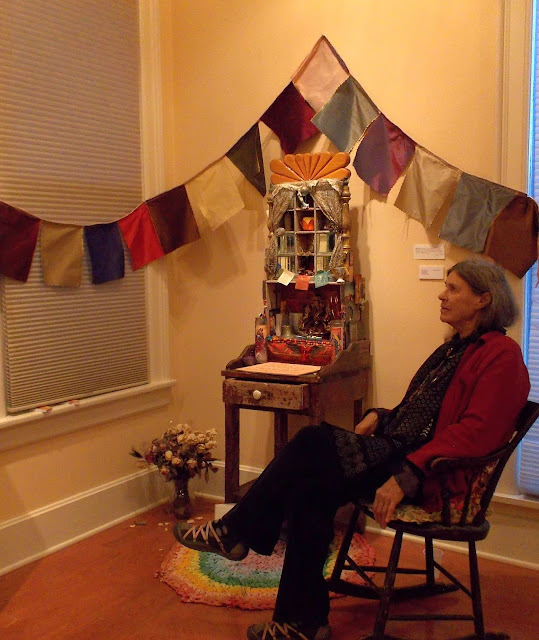 In spite of rain and street repairs, an appreciative crowd came to participate. 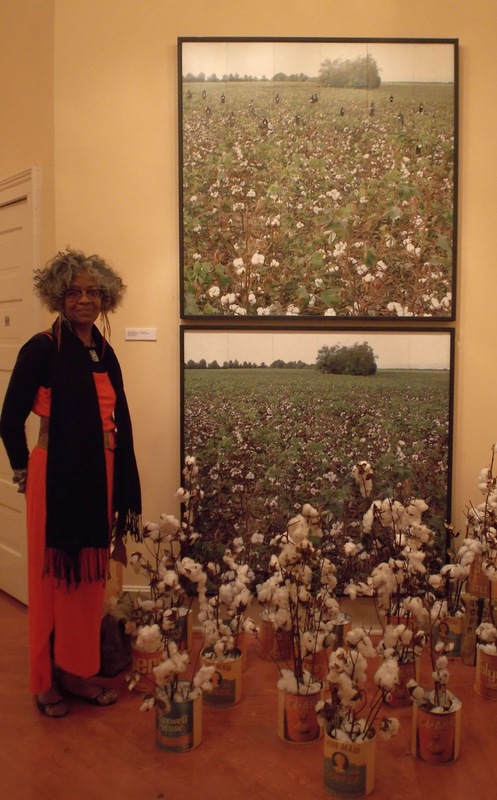 Each artist in the exhibit developed his or her work with care and attention to honoring meaningful moments of their ancestral or present day life stories. Love and nostalgia is evident in each heartfelt piece. Of all the exhibits in the Creation/Migration series, this latest seems most personal and close to the hearts of the creators of the work. The viewers, therefore, were curious and personally touched by the meanings within the artworks. Equally touching and poignant was the poetry reading by Max Early. 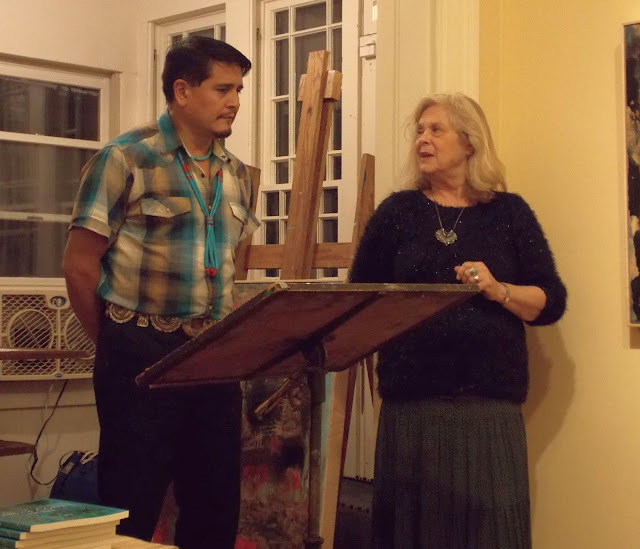 The ancestral voices and stories of Max's Laguna Pueblo family and culture resonated through the gift of his words. 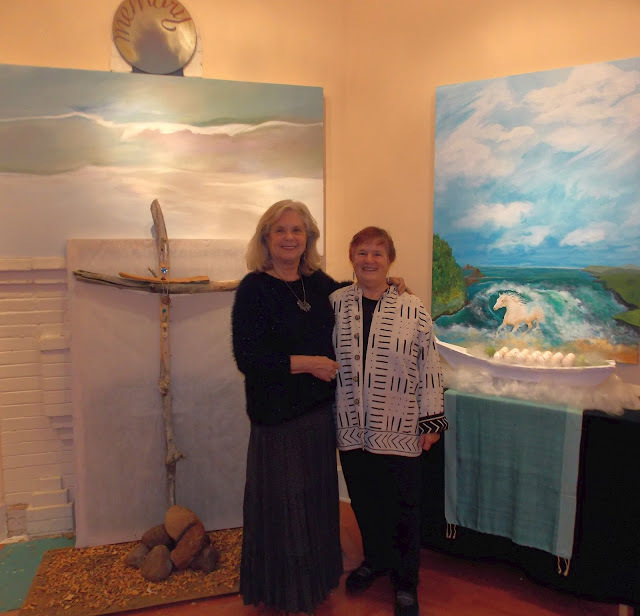 Here are some photos from the exhibit. Jaymes Dudding, "Fire Fighters' Memorial Flag"
Kai Harper, "We're on our way to no where"
Jean Nichols, "Altar de Amor"
Betsie Miller-Kusz, "Cruz del Tiempo". 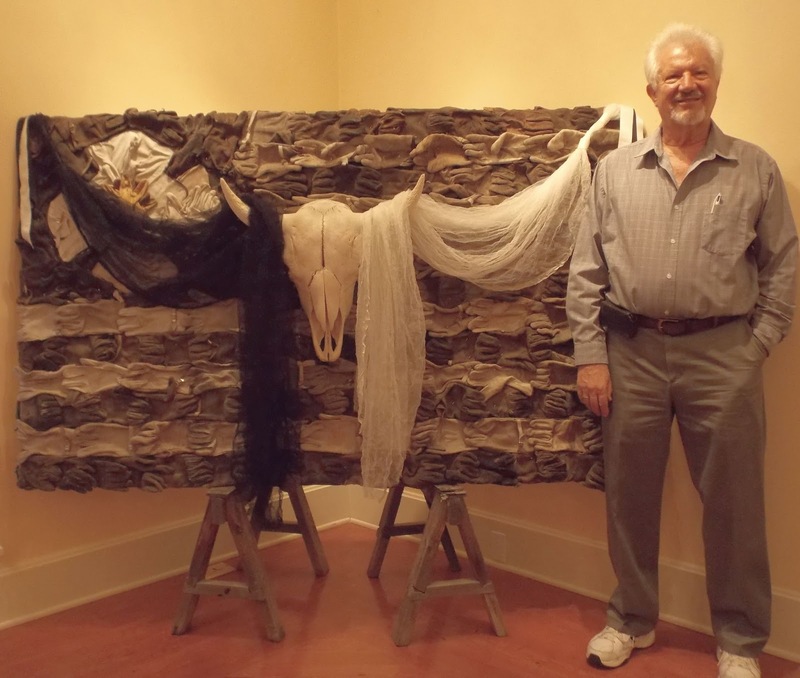 Donna Caulton, "Journey Between Two Worlds"
Donna Lea, "Valles Caldera Descanso" and "Altar"
Max Early, "Carry Your Canteen on Your Journey Home"
Krystofer Meadows, "Alabama Now and Then.....ancestral memories"
Set-up Preview: "Descansos Along the Ancestral Road". 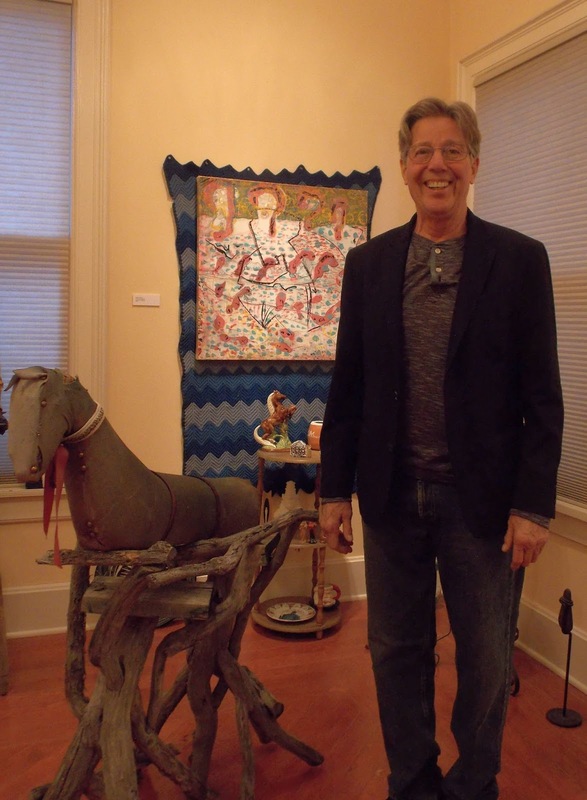 The Creation/Migration Group, as it approaches the end of its 4th year, presents an exciting new exhibit honoring the pathways of their ancient, mythical and modern day forefathers and mothers. 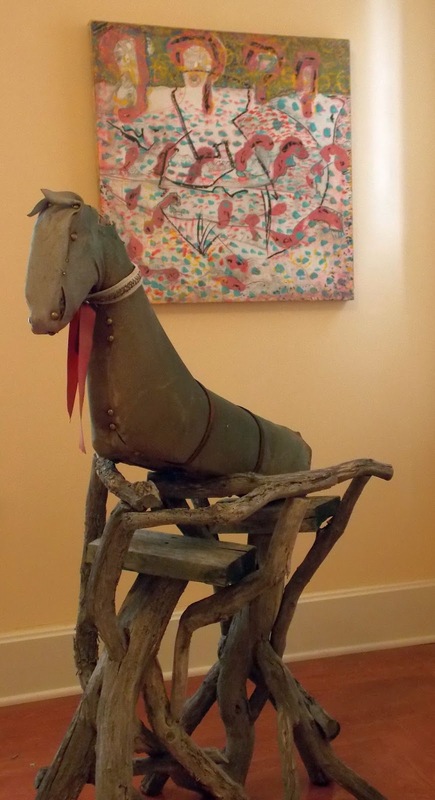 Returning to Freestyle Gallery, site of their first exhibition in 2012, founding members of the group, Betsie Miller-Kusz and Donna Caulton, have selected the title theme, Descansos Along the Ancestral Road. This installation of personal altars and descansos explores the stories and journeys of honored ancestors, loved ones and children who have crossed from and to other worlds, over the rough seas and harsh lands of emergence and migration. 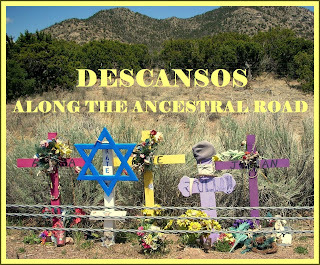 Since the Descanso is a specific roadside marker for those who have died in transit, it has formed the starting point for the visual representation of these journeys. The northern New Mexico artists presenting work in this exhibit are Donna Lea (fabric), Jaymes Dudding (mixed media), Kai Harper (mixed media), Jean Nichols (assemblage), Max Early (clay), Ralph Greene (painting), Krystofer Meadows (collage), Betsie Miller-Kusz (mixed media) and Donna Caulton (mixed media). 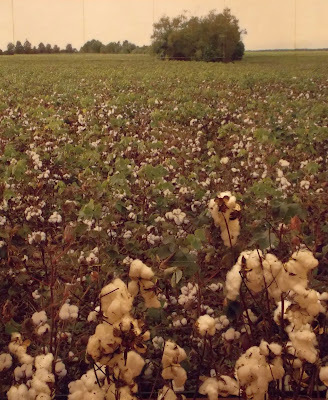 The artists come from diverse heritages, which will be richly reflected in their work. 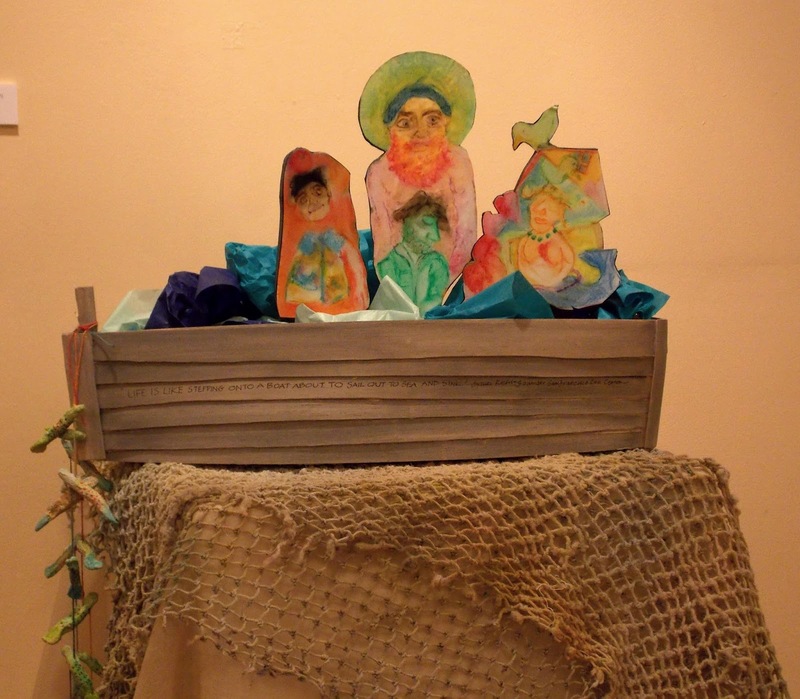 At the time of this posting, the show has not been completely installed, the lighting is not set, and all hands (and artwork) are not yet on deck. But please enjoy a couple of sneak peeks of some of the works that will be seen. Hopefully these will stimulate your curiosity enough to realize this thought provoking exhibit it not to be missed. Ralph Greene has only begun his installation as seen on the left. He is incorporating many meaningful ancestral artifacts with his own personal imagery. We are all waiting to see what is yet to unfold. 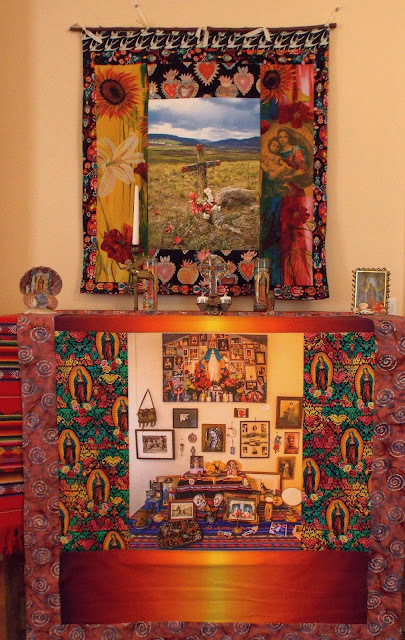 Fabric artist, Donna Lea, has incorporated her two pieces, Valles Caldera Descanso, and Altar, along with other fabrics and symbolic additions (see below) into a stunningly luminescent altar. 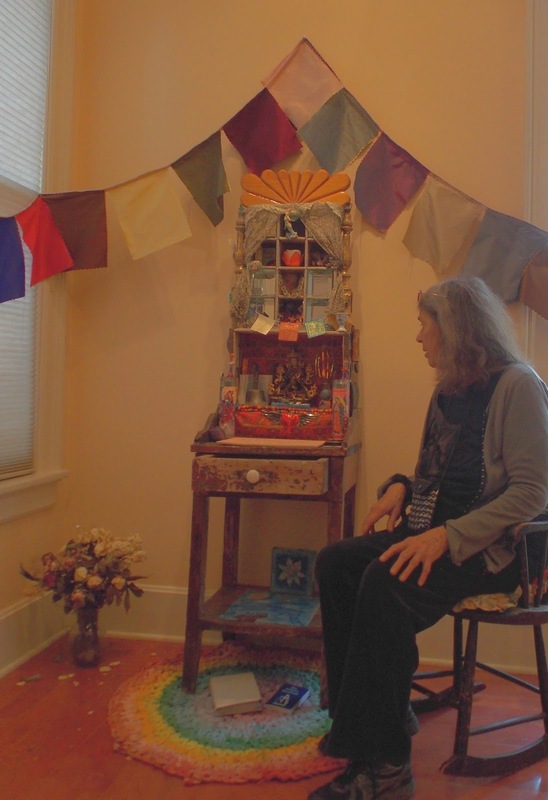 Sitting within her Altar de Amor is artist Jean Nichols. This is exactly what she would like the viewing audience to do. The piece is interactive and there is more than one way to "be" within its surround. Listen to its voice and yours. 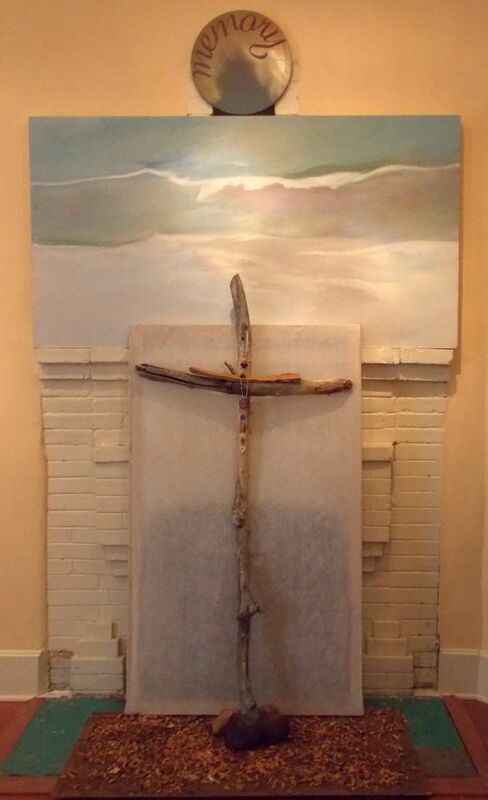 Cruz del Tiempo by Betsie Miller-Kusz honors the sacred interaction of earth and air and memory. 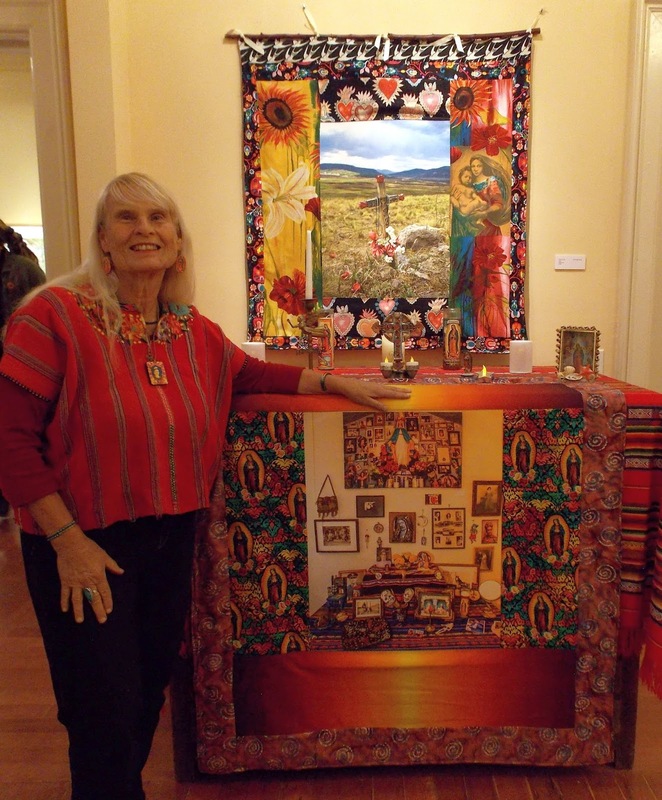 There will be a public reception for the exhibition on Friday, November 4 from 5-8 PM with refreshments celebrating the Day of the Dead festivities in Albuquerque. 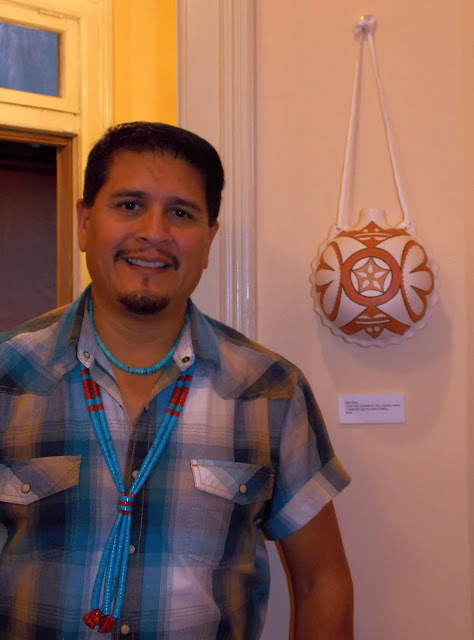 At 7:30, during the reception, there will be a poetry reading by Laguna Pueblo artist and poet, Max Early, whose poetry so eloquently expresses his respect for his ancestral ways.